The launch of the E-Tendering System in favor of the SMEs working in Duqm. H.E. Yahya bin Said bin Abdullah Al-Jabri, Chairperson of the Special Economic Zone Authority in Duqm (SEZAD), signed two usufruct and development agreements, the first of which with Bin Zayed International Investment Group on Sunday (4 November 2018) to develop a commercial, tourist, educational, and recreational complex in three phases. The second was with Al-Shomookh Mining Industries Company, which plans to implement seven industrial projects in several stages in the heavy industries zone in the Special Economic Zone in Duqm (SEZD). These projects would provide 2000 jobs. Ahmed bin Zayed Al-Mahrami, Chair of Bin Zayed International Investment Group and Al-Shomookh Mining Industries Company, signed both agreements on behalf of the companies in the presence of H.E. Dr. Ahmed bin Mohammed Al-Futaisi, Minister of Transport and Communications, and a number of officials and businesspeople at the Kempinski Hotel Wave Muscat. SEZAD allocated 500,000 square meters for Duqm Commercial Tourist Gate project in the tourist zone on Duqm coast. The total investment cost of the project to OMR 38,000,000. The project, which will be implemented in several phases, will include a commercial complex in the first phase. In the second phase of the project, freehold apartments. Last phases include the construction of a water park and school. 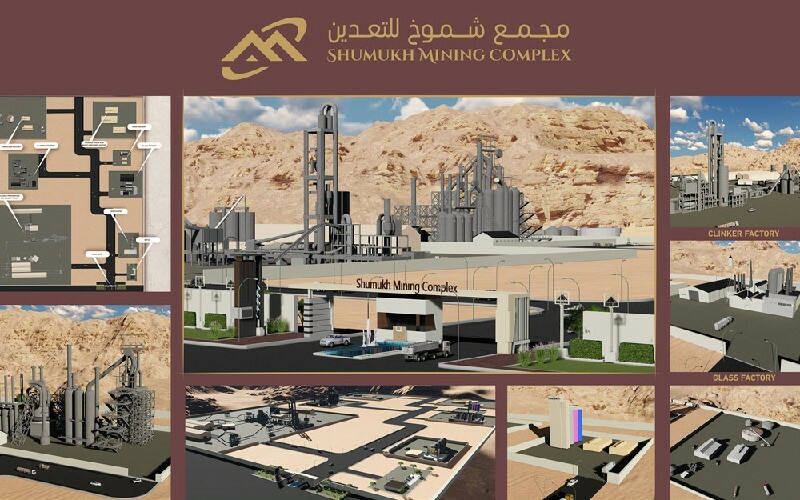 Al-Shomookh Mining Industries Complex is an integrated mining complex for which SEZAD allocated an area of 250,000 square meters with total investment cost is about RO 95 million OMR. Al-Shomookh Mining Industries Company will implement the project in several stages. The first phase includes the construction of a clinker plant and a lime production plant. In the second phase, the company will build a paint factory, a glass factory, a waste container manufacturing plant and an aluminum factory. In the third phase, the company will establish a fertilizer plant. For its part, Duqm Quarries Company signed memorandums of understanding (MoUs) with Bin Zayed Investment Group and Al-Shomookh Mining Industries Company. Eng. Ali bin Abdullah Al-Zidjali, General Manager, signed the MoUs on behalf of Duqm Quarries Company, while Ahmed bin Zayed Al-Mahrami, Chair of Bin Zayed International Investment Group and Al-Shomookh Mining Industries Company, signed the MoUs on behalf of both companies. Under the MoUs, Duqm Quarries Company will supply raw materials of limestone and dolomite stone for the factories scheduled in the mining complex. Duqm Quarries Company will also supply Duqm Commercial and Tourism Gate project with raw materials, such as gravel, sand and some materials used in the construction stages of the project.